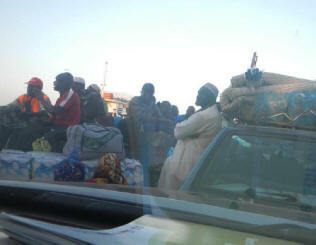 Yesterday Essa Camara, Momodou Ceesay, Harouna Bojang and I traveled from the Banjul-area to Essau and Kerewan. We got a late start (6pm) since we were waiting until work at GPPC had finished for the day. The work week is from Monday through Thursday and so leaving on Thursday gives us 3 days up country without disturbing work commitments. The ferry crossing to Barra took a couple of hours since the ferries are traveling extremely slowly through the water. Catching the 6pm ferry we were able to cross by 8pm. I have been on this crossing in the past and it has lasted 40 minutes. As an overloaded ferry, it was both unnerving and uncomfortable. I was in a very comfortable vehicle and not sitting on the side of a car for those many hours as many Gambians with small children were. I was lucky. By the time we got to Essau it was dark. I had promised Fatou Saidy and her family I would see them during this trip – i.e. 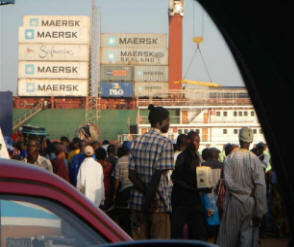 see them at their compound. After several calls to locate them, I found them waiting by the side of the road near their compound entrance. Because of the late hour and our commitment to meet the villagers of Kerewan, we could not visit more than 15 minutes. It was sad to go after such a short stop. 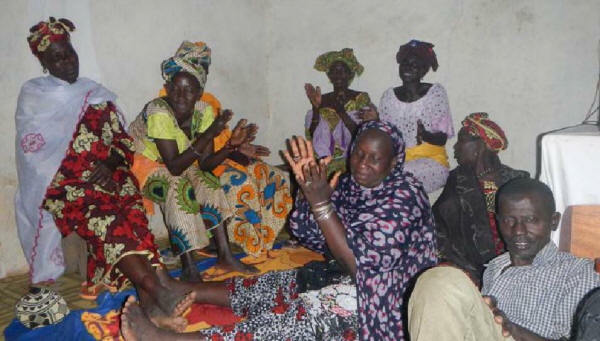 Present in the compound were elderly women, Fatou, Mariama, Fatou Joof (a former education student, now librarian) and many small children supported by this compound of women. We reached Kerewan at about 10pm. Many of the villagers were expecting us during the day – a miscommunication, and so we were only able to meet with the key members of the Village Development Committee (VDC). There were about 25 people crammed into a small, very hot room – many women were crouched down on a small blanket laid out on the floor. Many elderly men sat in chairs along the room’s perimeter. I was given the history of the development of Kerewan. The VDC chairperson told me that the village is made up of & Cabulos, or families. 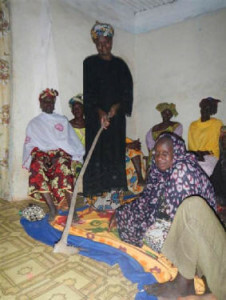 The Ceesays provide the Imams of the village while the Fattys provide the Akalos. The names are: Ceesay (Imams), Fattys (Akalos), Hydaras, Jawara, Banta Su, Ma Jawara Kunda, and Samusa Kunda. Each Cabulo selects a member to the VDC. This prevents the committee from being dominated by any particular family or tribe. He further stated that if the VDC becomes dysfunctional, then the VDC is dissolved and the Cabulos are again assigned the task of sending a representative to the VDC. iWoman showing me the garden implement used to tend to the rice field. The way in which the village selects community projects is democratically based. The VDC Chair stresses this fact and makes sure that there is no monopoly based on family affiliation or tribe. 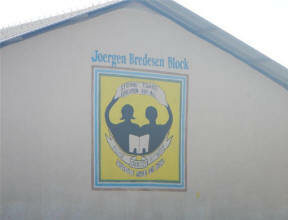 Development of their nursery school – ages 3-5 children attend. I described our work and our limitations given our capacity. I described our process of funding projects [25% of costs supported by beneficiary community] and they said that is how they have been doing projects for many years. At the end of our meeting, prayers were given and the women started to sing about Toubabs (White people) in 3-part harmony. By the time the meeting ended it was 11:30PM. Momodou Ceesay took us to the Badala Lodge for the night. 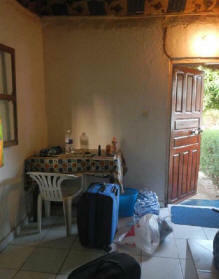 We took 3 bungalows and asked the proprietor to leave the generator on until 3:00AM. I was wide awake after the long meeting and stimulating conversation so having the generator on was nice – plus the fan worked! 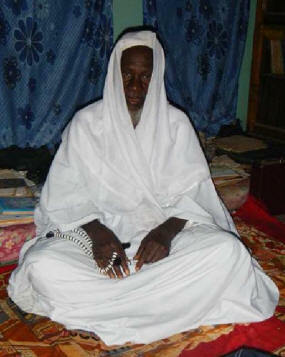 During our visit in Kerewan we also met the Imam – Imam Ceesay. He posed with his robes on and as we sat listening and receiving prayers, this small child peeked in to greet her father, the Imam. The Badala Lodge was reasonable in terms of cost and provided us a clean, safe place to sleep for the night. Some pictures below capture our surroundings and the lodge amenities. It is 4:45 am and the Call to Prayer is beginning. I went to a Rotary meeting last night and we had no lights, still no lights! 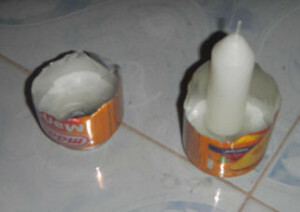 My candles sitting within their pop can holders ( a pop can torn in half makes two holders). The candles are burning strong. I love those 8 hour REI candles! Off to the rural areas this afternoon. Since I switched antibiotics my tooth pain has been fading…whew! Today I awoke at 3 AM and started writing. I typically have 20-25 e-mail messages that need responding to daily and I like to use the quiet time to do this – writing about events of the day, writing about project evaluation design, writing consultancy contracts and setting/revising trip goals. I spent about two hours segmenting out all of the school payments we will be giving to schools in the Central River Region during our trek up-country on Thursday. There is a lot to do and a short amount of time to do it in. It is better that the trip will be quick given my tooth continues to cause me discomfort. After it gets about to about 5 AM I go to the pump and start filling the 7 buckets I need, in order to replenish the water that was used the day before for bathing, laundry, cooking, and dish washing. It takes me 30-40 minutes to get everything filled. The water comes out slowly from the tap so I try and get other tasks done while it is filling. A couple of times I forgot I had the bucket filling and found the water gushing over the rim! 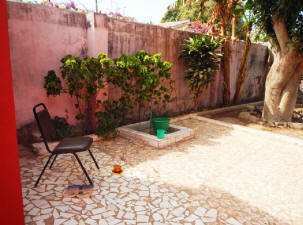 Water is precious here and so now I sit and enjoy the garden and watch the bucket as it slowly fills. It is 12 PM and I am heading to the office soon. I had some tomato soup with saltine crackers for breakfast. Lunch comes about 3 PM. Tomorrow (Wednesday) we do all of our buying for the trip up-country. 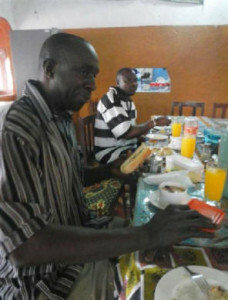 I understand Essa’s boss, Momodou Ceesay, will be joining us in Essa’s blue pick up. We will have a very good driver – one that is quiet, easy going and is professional. It is Momodou’s driver and he is the Managing Director of the Gambia Printing and Publishing Company. Specifically, Momodou is taking us to Kerewan, his home village. I had read about Kerewan as part of my course work in Urban Global Education, (sponsored by Teachers without Borders and Johns Hopkins). The 2012 “Education for All” policy report results indicated that Kerewan had a reading/literacy rate lower than any other part of the country. 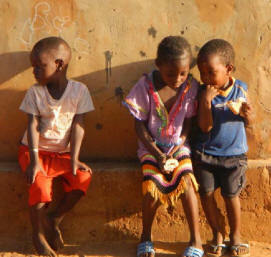 If I can do anything, I can adapt my work to meet the most distressed areas in The Gambia. I look forward to meeting the Akalo (village leader) and seeing how the schools are performing. This is fortuitous – Essa’s boss having come from the village and the course-work leading me to the area through an analysis of the statistics. Well, we did make the news last night! Essa didn’t have electricity last night so he didn’t even see it. The piece didn’t use my name but called me Binta, my Gambian name. They also highlighted University District Rotary. Fortunately we had made a banner with GambiaHELP on it that showed in the presentation. Anyway, it was a good piece. I guess I am so integrated with the community now that my American name doesn’t matter anymore. I plan to ask for a tape of the news segment which is about 4 minutes long. Also, at the handing over, Essa’s mother cut two of her banana trees down and had them stuck in the ground at the handing over site. As part of the program I had to help cut down the banana bunches with a member of women’s group and with my Toma, Binta Badjie. It was a first for me and I asked Essa what it was all about. He said it means that the relationship is “natural” for no other reason than love for one another, the purest form of a relationship. It made me feel good. This is a picture of Kadysa and I and then the banana man who helped hold the tree. 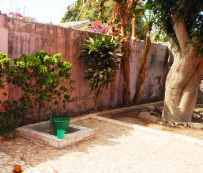 A Toma is someone you are named after – it is a real honor and reflects the rearing, grace and all the qualities of typically the older person you represent – the name is given to you because f a relationship and those qualities that are transferred to you as representative of the Toma are for you to uphold and honor. It is a good way to socially control behavior. Your shame is shame onto the Toma as well. To honor her, you honor yourself. Yesterday I had the pleasure of participating in a Career Day as part of a Rotary function at Scanaid Senior Secondary School in Brufut village. There were children from three other Senior Secondary schools present – SOS Children’s Village, Brufut Upper Basic School and Kotu Senior Secondary. The Career Day was announced at the Fajara Rotary Club meeting that I attended last Friday evening – held at the Senegambia Beach Hotel. French teachers & students from a program in The Gambia which offers French language training in Dakar, Senegal. GambiaHELP represented by me (Shelby C. Tarutis), a University District Rotarian and Director of Gambia Health Education Liaison Project, a non-profit organization working in international development in The Gambia. The day started with school children gathering under canopies in the courtyard of Scanaid Senior Secondary School. Each school assembled under their own tent or under the huge trees. 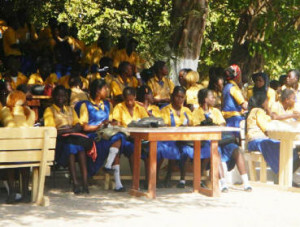 The Scanaid students are pictured to the right under the shade trees. 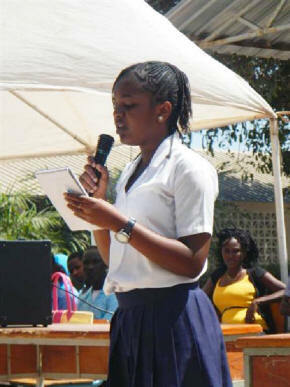 Starting at 11:00 AM, there was a line up of students presenting: a drama – the story line, do not settle for menial employment; a singer who sang for the hungry and brought many to tears; a young girl who delivered an extemporaneous speech about raising voices in Africa and promoting change; and, a poet who wrote a poem about the pen being mightier than the sword. A Drama about unemployment and the message: Strive above menial positions. A moving song about ending hunger, helping others and rising above. 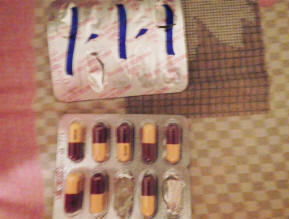 It is my second day of treatment for an abscessed tooth. A call to my dentist and I found out what kind of antibiotic I needed. I text’d Essa and he went to Malick Chemists to locate the medicine. Feeling better and not so tired. Although, I am up late due to tossing and turning – now, 2:30 AM. Tough trip, sick twice now. 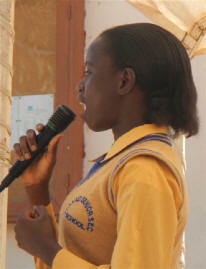 Tomorrow I at 10:00 AM I will be at a senior secondary school to participate in Career Day. 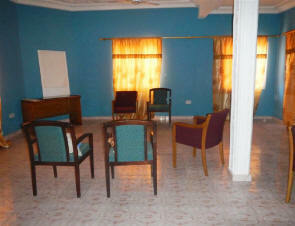 Rotarians from the Fajara Club will be at desks – i.e. BANKER, ACCOUNTANT and students will come to talk to them. I am interested in hearing what the girls want to be when they grow up…to report on that later. multi-million dollar project to build four connected labs for students to learn chemistry and physics has only been partly constructed. 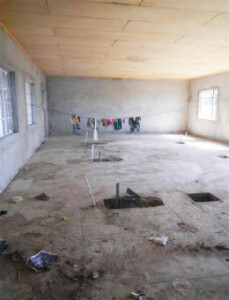 There are few funds left to do the major finishing of this project. It is so terribly tragic when mis-management, and outright stealing of project funds destroys the wonderful potential a project has. Today I had the pleasure of meeting with Fatou Saidy and Mariama Keita. 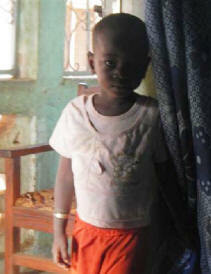 Mariama is a young girl whose education is funded by the Zwinggi Family in California. 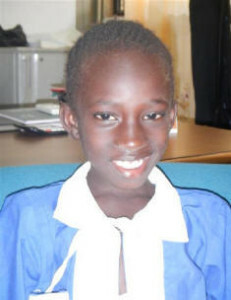 Mariama’s favorite subjects are English and mathematics. 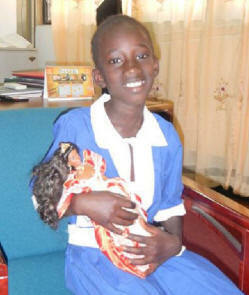 She is pictured here with her new Barbie. As we waited for Essa Camara, GambiaHELP Coordinator, Mariama drew a picture for the Zwinggi family. 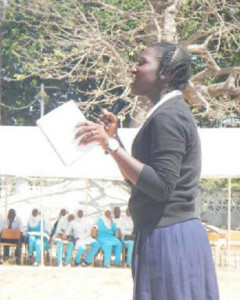 When asked to sign her picture, Mariama pulled a small, crumpled piece of white paper out of her school uniform pocket from which to copy her penciled name onto the drawing paper. Her drawing consisted of many smaller drawings. In asking what the drawing depicted she said, a tree, a man on the tree, a mango, food in a bowl, a basket, a knife, and a house. All these things are familiar to and important in the life of a young girl. A Mariama smile that comes when asked to “chuckle”. 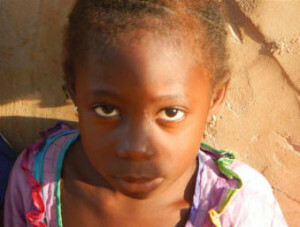 Smiling in photos is not common in The Gambia – in photos, people often appear “straight faced”. Fatou Saidy, sister of Lamin Darboe. 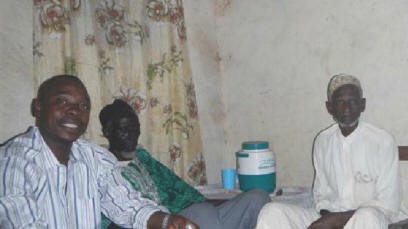 Lamin Darboe is one of GambiaHELP’s volunteers. She is a friend to Mariama’s mother, named Mariama Saidy. Fatou brought Mariama to Kanifing today. 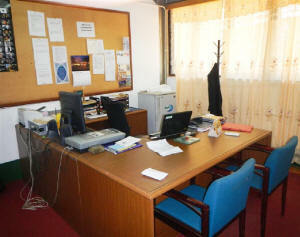 Essa Camara’s office at Gambia Printing and Publishing Corporation. (GPPC). My desk sits behind the blue chairs. The building has air conditioning – a step up from my location in San Cheba. In addition, the building has generator back-up which is marvelous. 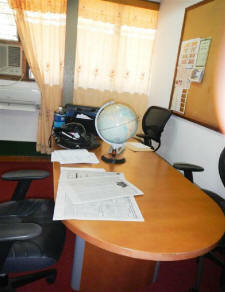 My workspace at the Office at Kanifing where we met Fatou and Mariama. 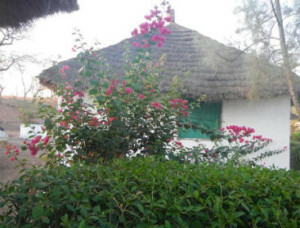 The two-bedroom house is located in San Cheba right next to the market and between three mosques. A small mosque, which holds about 25 people, is around the corner, a large one kitty corner from it and a medium sized one 3-blocks from there. I hear the Muazzin call to prayer every morning at 5am and then again 4 more times during the day. It is an other-worldly kind of sound – a sing song prayer, chant combination that rouses everyone to their mats for prayer. The house is new yet there are some significant challenges. None of the water tanks – installed in the bathroom, kitchen do not produce water to the faucets or toilet. I use several buckets, an oil jug and a large plastic garbage can to hold water. Hence my daily bucket bath. Sometime thrice daily. There is electricity – cash power. You put in a certain amount of money in an electrical account and use electricity until it abruptly stops. After that, you must go to the NAWEC (National Water and Electricity Company) office and make a payment on the account. I have yet to see it stop but would like to plan ahead and add funds before I find I can’t charge the phone or computer. Above is a photo of the outside of the house. It stands out from the rest on the block since it is painted red. Most homes are painted mild yellows, white or cream colors. 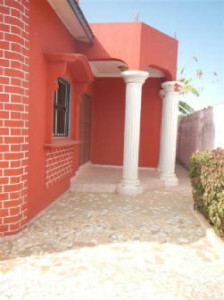 The house is located in a compound. There is a fence around the yard and then a housing block that contains 4, small two room apartments. One holds a watchman at night. He comes at 7pm and leaves in the morning at 8am for another job. His name is Edi, short for Edrissa. Books for Africa is an organization dedicated to ending the “Book Famine” in Africa. 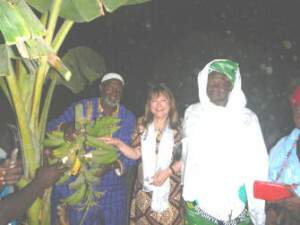 GambiaHELP received recognition from them for our assistance in making this dream a reality. GambiaHELP has shipped more than 500,000 books to The Gambia over the past 12 years. You know that being able to enjoy a novel, study a textbook or access a library is not possible in many communities across Africa. 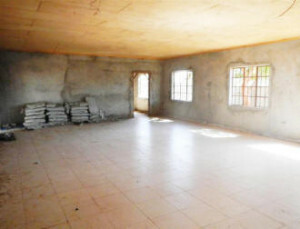 By mobilizing funding to send a container of books you have helped get those books into the hands of African children and onto the shelves of many village libraries. Books For Africa would like to take this opportunity to acknowledge your dedication with the enclosed certificate. Thank you so much for your part in empowering the next generation of Gambian parents, teachers, business people and leaders! 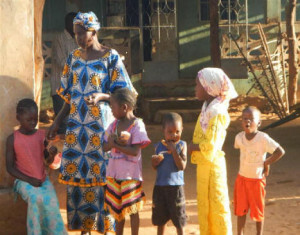 The executive director of Gambia Health Education Liaison Project (GambiaHELP), MPH Shelby C. Tarutis, recently granted an interview to The Point on the intervention of her project in the country. 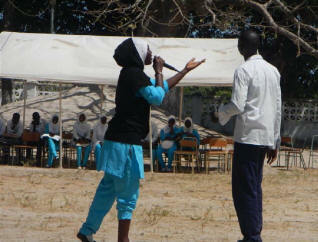 According to her, they have been working in The Gambia for 13 years in education and health. humanitarian charity for women and children, especially for those living in the rural area. “The past 13 years we provided 16 containers with medical and education materials to all regions in The Gambia,” she pointed out. 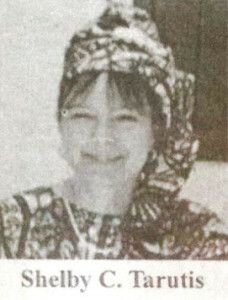 According to her, in the 1980s she was posted as a peace corps volunteer in Dankunku as health educator and nutritionist. They have so far built a skills centre, schools, and libraries and have been supporting women projects in the country, she said. They have also provided support to such places and institutions as Kudang, Jappieh, Sambang, Dankunku, Sitahurma, Sofanyama, Banjulinding, Bonto, Nyaye Sanjul, SOS Children Village and SBEC International. Shelby C. Tarutis was born in Seattle, Washington, USA and attended Evergreen State College earning a Bachelor of Science degree in Biochemistry. 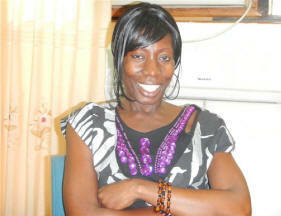 She later obtained a Masters of Public Health degree from the University of Washington specializing in Health Services.